PX series is a flatbed, 1 or 2 needle double chainstitch machine for decorative stitch patterns using picotting and fagotting. 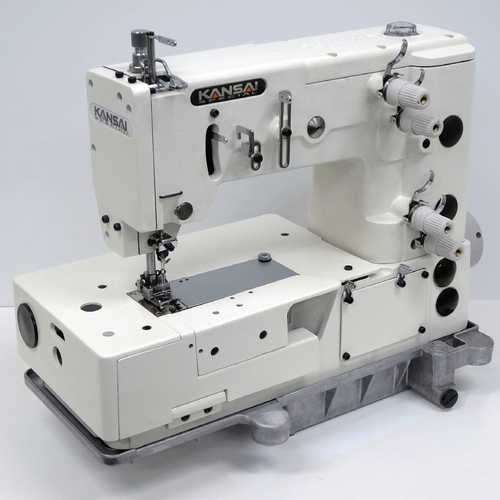 This machine’s can sew zig-zag by the built-in cam that moves the needles left and right (2-5 points). MAC100 is a 1 needle computerized PX 4 points zig-zag machine, which has a great variety of combination between zig-zag design and flower picotting by electric system. Applications: Picotting and fagotting, flower stitching (Flower Picot). These machines can be used not only for women’s and children’s clothing but also handkerchiefs, table napkins. Please click here to download KANSAI SPECIAL general catalog. User name and Password are needed to download Instruction manual and Parts book. © 2019 Morimoto Mfg. Co., ltd.